Light and creamy chicken chili made in your crockpot with avocado, fresh cilantro, and a hint of lime! 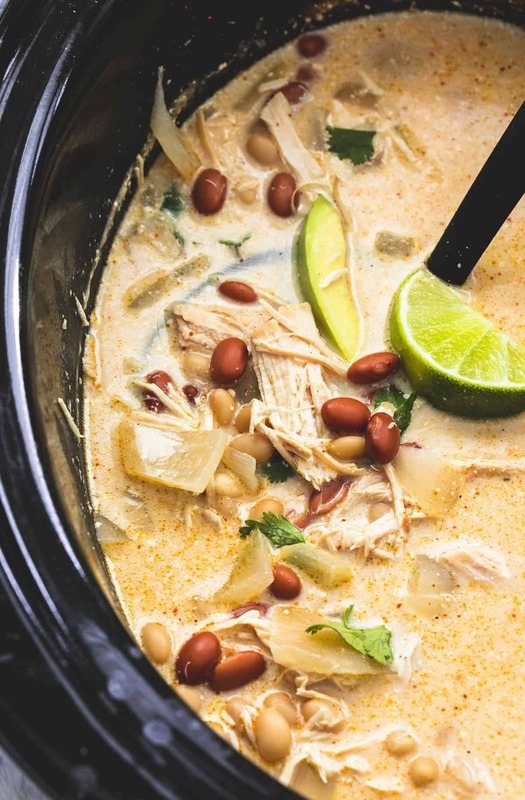 This Slow Cooker Cream Cheese Chicken Chili is a huge hit with even the pickiest eaters! So easy. So tasty. This is what weeknight dinner dreams are made of. This is one of those things that happened because I was craving a few different flavors and needed them pronto. As in, today. So I combined chicken + two kinds of beans + and cream cheese in my crockpot and this is what happened. 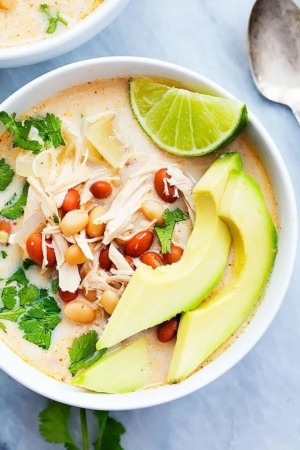 This light and creamy chicken chili that I just can’t get enough of. 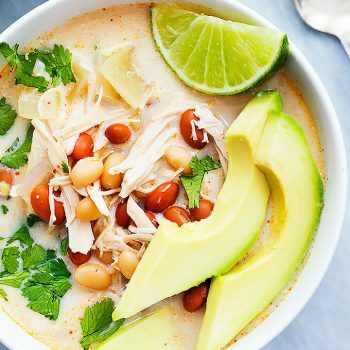 The recipe says to add sliced avocado “if desired” but I may have to change that to you will definitely regret it if you do not add avocado to your bowl of steaming hot cream cheese chicken chili!! because after trying it without and then with the avocado it’s like going from hey that’s pretty yummy to I NEED MORE! So skip a step and add avocado. I’m doing you a favor here. 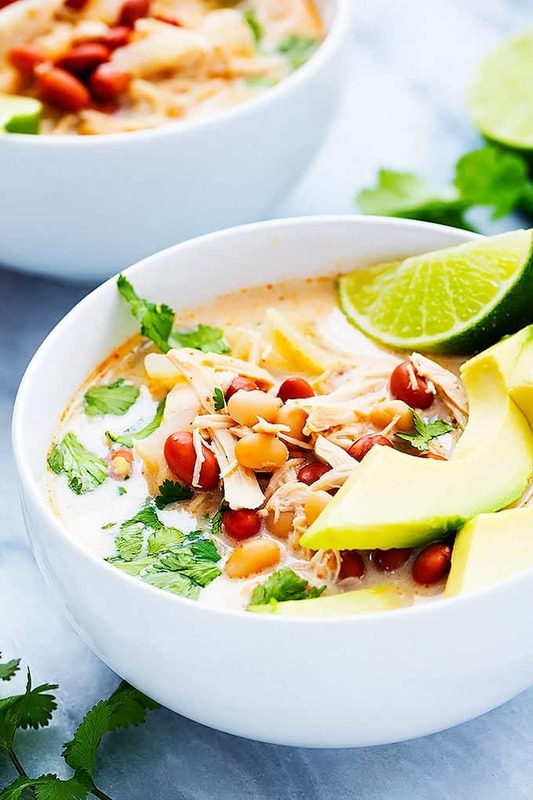 Light and creamy chicken chili made in your crockpot with avocado, fresh cilantro, and a hint of lime! Add chicken, broth, beans, onion, and seasonings to slow cooker. Cover and cook on high 2-3 hours, or on low 4-5 hours. about 30 minutes before serving, add cream cheese. Cover and cook another half hour. Uncover, stir to mix cream cheese into soup and shred chicken with two forks. Taste, add salt and pepper to taste as needed. Stir in chopped cilantro. Serve hot and top with shredded cheese and avocado slices if desired. 1. Add chicken, broth, beans, onion, and seasonings to slow cooker. Cover and cook on high 2-3 hours, or on low 4-5 hours. 3. Uncover, stir to mix cream cheese into soup and shred chicken with two forks. Taste, add salt and pepper to taste as needed. Stir in chopped cilantro. Serve hot and top with shredded cheese and avocado slices if desired. Try these other Chili recipes you'll love! This sounds like just what I need after having pneumonia. Looks so yummy. I am so glad you have the beautiful pictures to go with your recipes. 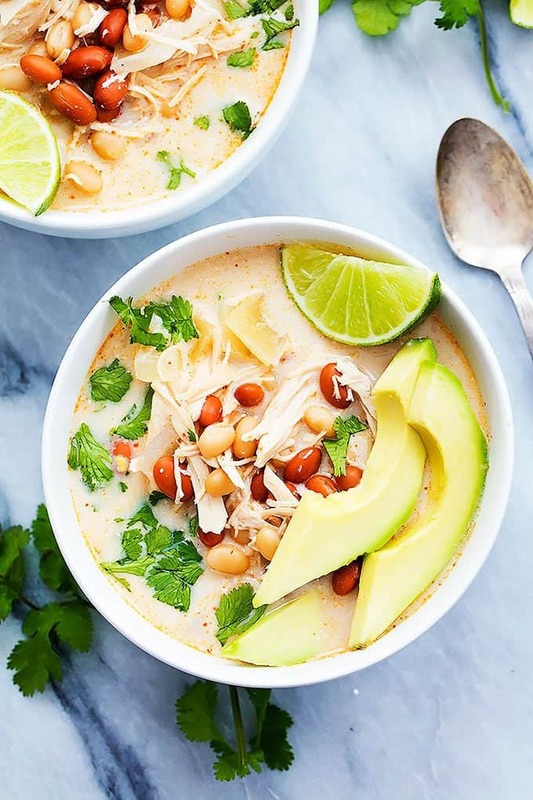 Gorgeous soup….I love soups that you add avocado to them! Quick ? Regarding how to cook chicken. Are you suppose to throw breasts in and cook then shred? Sorry about the confusion, I’ve updated the directions to be more clear on that! Is the checked frozen? Thawed? Cooked? Your recipe doesn’t indicate. Just made this and it is DELICIOUS. I shredded some garlic in too for some extra flavor. Thanks so much- definitely will be making this again. My other white chicken chili recipe says to cook the chicken first, I think for health/safety reasons. So in this recipe, do we put the Raw chicken in the crock or cook it first? This was really bland. I made it per the recipe and the flavor was lacking. It was also too runny to consider it chili. I like it as a base, THOUGH, and will be trying again with a few changes (more spices, heavy cream, no cream cheese). I love this recipe! Is there any way to convert it to a stovestop recipe, rather than crockpot, for faster cooking? Hi Rachel- Yes, it can be done! Bring to a boil on the stove, add room temperature cream cheese. Use rotisserie chicken or other pre-cooked chicken and stir it in at the end! Hope you love it prepared this way as well! HOw big of a slow cooker do you use? I use an 8 qt slow cooker.